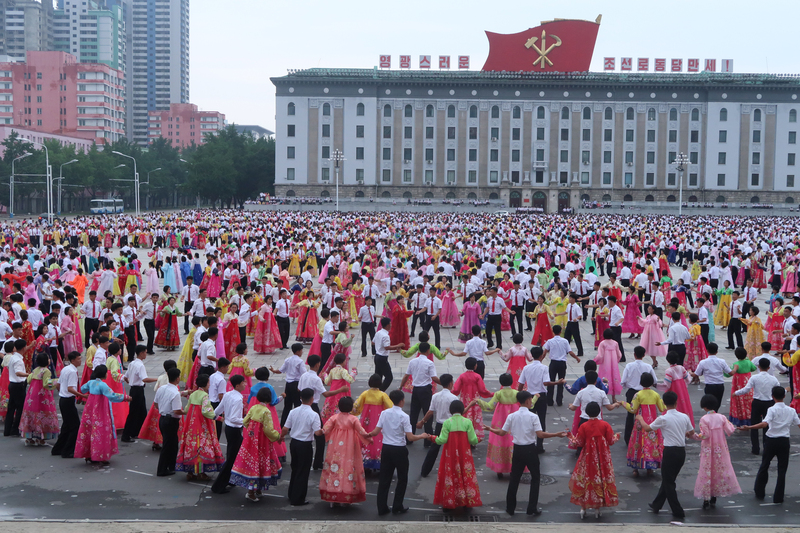 This year come join us as we take part in the celebrations happening in Pyongyang for the Party Foundation Day holiday including a mass dance, fireworks and any other surprises that are announced during the festivities! 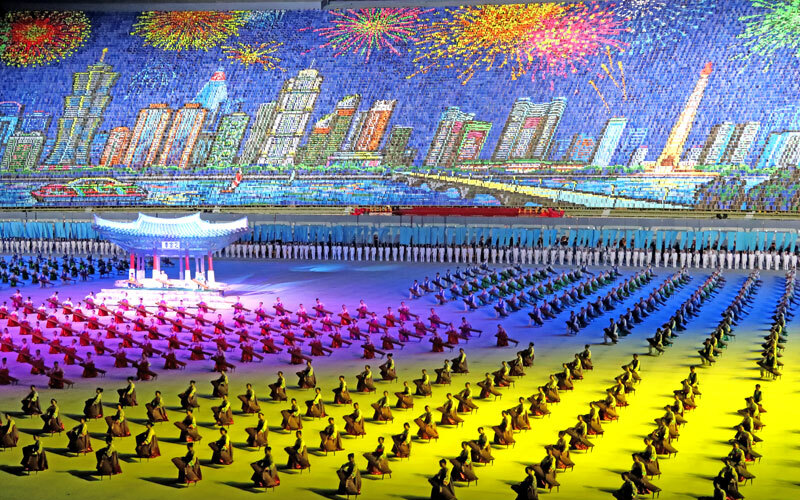 During our tour in Pyongyang we’ll be seeing all the must see sights of the capital such as the Mausoleum where both Kim Il Sung and Kim Jong Il lay in state, we’ll make our way up to the top of the Juche tower, ride the deep and mysterious Pyongyang Metro, visit the Korean War Museum and much much more. We’ll also head down to Kaesong city. This city is 8km away from the DMZ that separates North and South Korea. 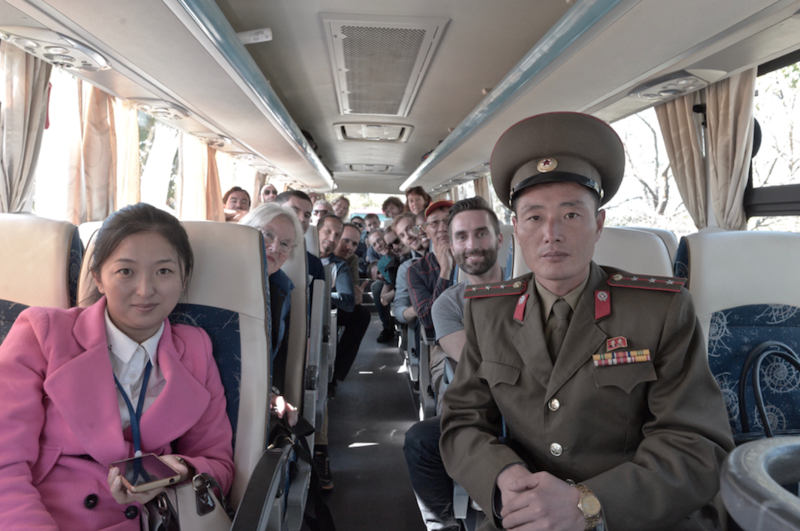 We’ll then make our way to Panmumjom (the DMZ site) where we’ll meet our own local Korean People’s Army officer for a detailed tour and history of the site. 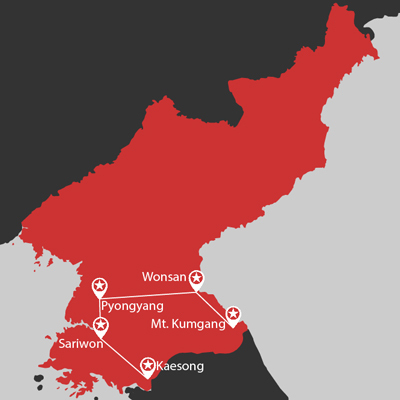 Our extended and highly recommended Group B tour will take us all the way to the east side of the Korean Peninsula to visit the famous Mt Kumgang region and the sunny coast of Wonsan city. 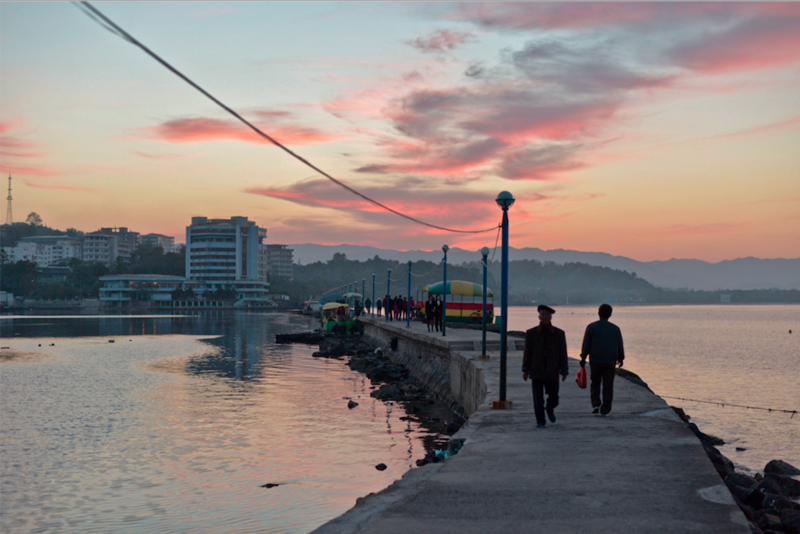 We’ll first arrive in Wonsan, which is a popular holiday destination for Koreans all over the DPRK. Here we’ll try the very delicious and very fresh seafood caught along the pier and to spend a special afternoon kicking a football around, playing frisbee and swimming with the local families. We’ll also have time to explore the newly renovated International Children’s Summer Camp. The following day we’ll head to Mt. 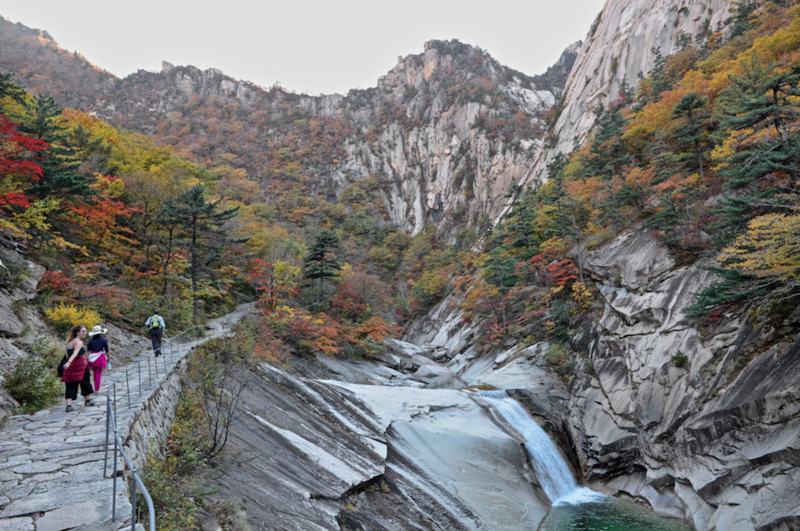 Kumgang and hike Kuryong falls and explore the gorgeous Samil Lagoon. With the Autumn season setting in, Mt. Kumgang is particularly stunning during this time of the year, featuring vivid and multi-coloured green, orange, red, brown foliage. 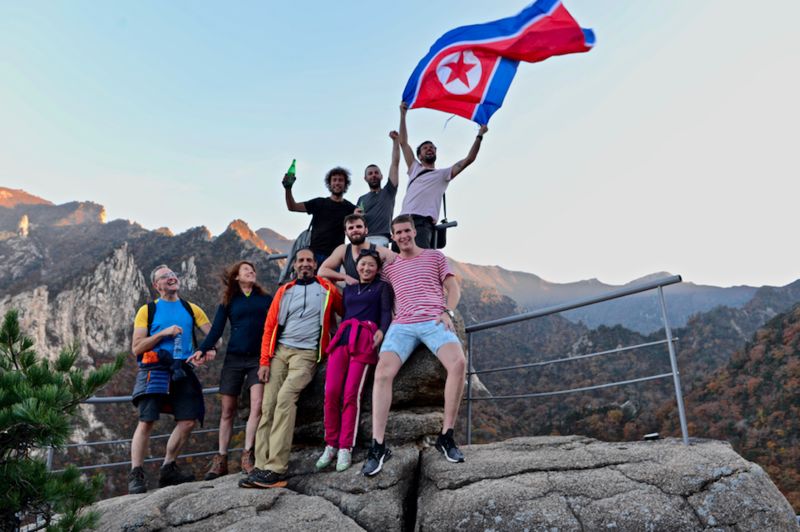 During our evening in this extremely scenic region we’ll spend a night at a lesser visited hotel before heading back to Pyongyang and concluding the tour in Beijing. We’ve also been given special access to a Russian Mil Mi-17 helicopter to take for a whirl around Pyongyang city for a unique aerial tour of the capital. This is our only group tour that heads to the Mt. 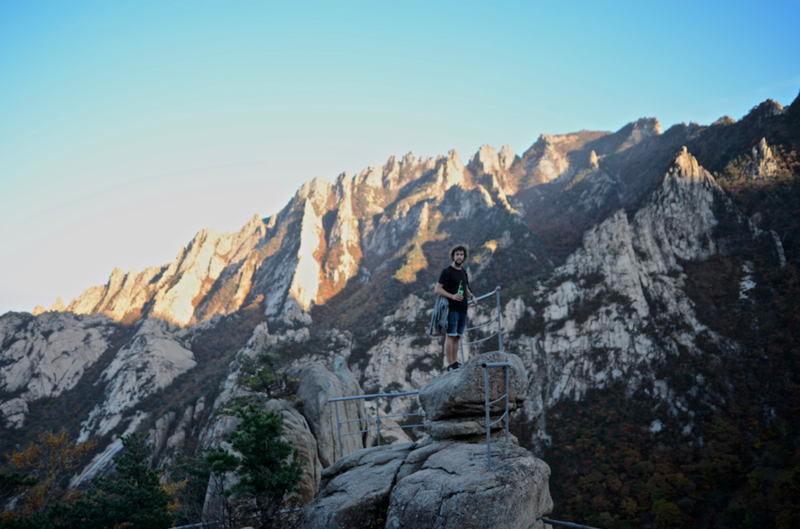 Kumgang region so be sure to book early to secure your spot on tour! Flight takers depart Beijing Airport Terminal 2 on Air Koryo at 12:55pm (meet the group at Air Koryo check in counter). 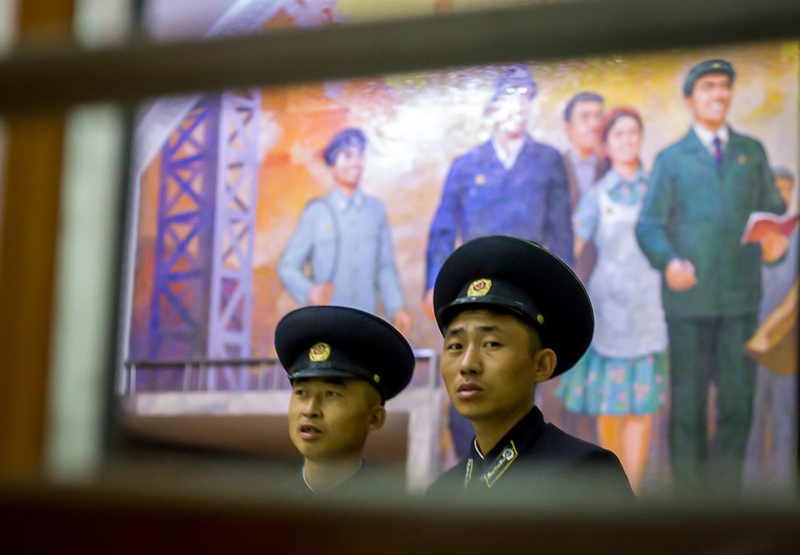 Visit Mansudae Grand Monument – the two large bronze statues of President Kim Il Sung and Leader Kim Jong Il overlooking the city (optional extra- you can present flowers if you wish: small bunches are 2 euro, larger ones 4). Korean War Museum – Let the expert local guide show you around the enormous museum featuring dioramas, locally used weapons, tanks etc, and captured American equipment! Visit Kwangbok Department Store – here is where most of the middle class in Pyongyang shop for local goods. 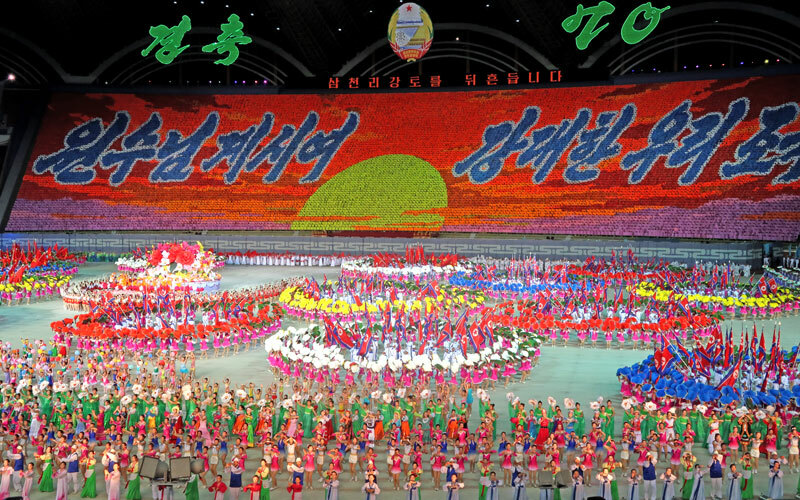 It’s also our chance to obtain local DPRKorean Won! Revolutionary Martyr’s Cemetery – The resting place of the greatest of the anti-Japanese revolutionary fighters, each grave features a bronze bust of the hero laid to rest within. 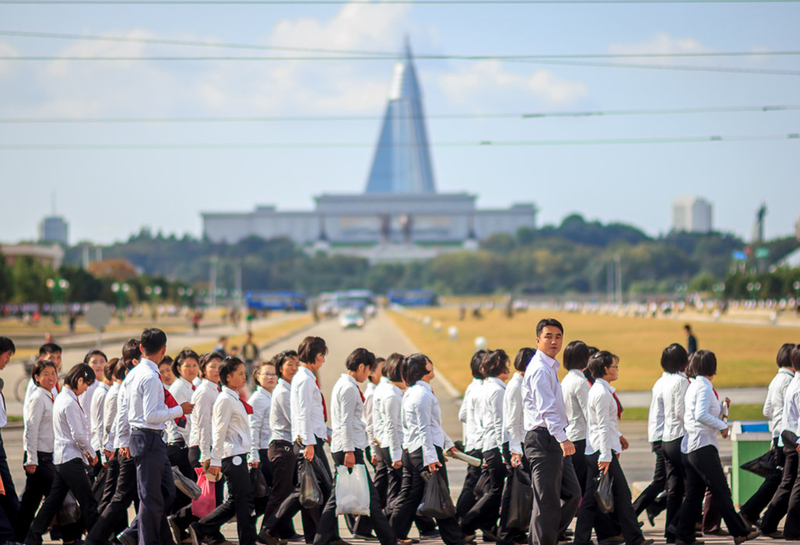 Walk up along Moran Hill located in the heart of Pyongyang. Here the locals visit the park to celebrate today with their families and friends with BBQ, dancing, singing and drinking. Fantastic opportunity to soak up the atmosphere. 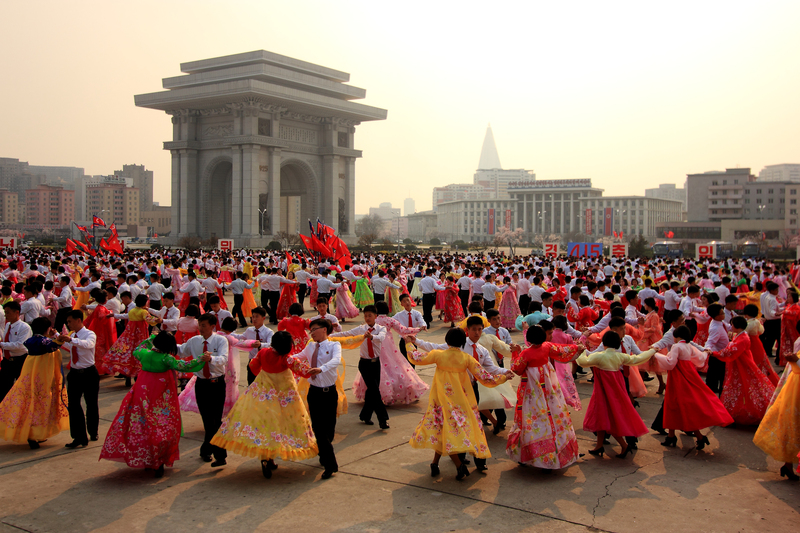 Participate at Mass Dance ceremony held at the monument. A fantastic unique photo opportunity! Also don’t be shy to jump in and dance with the locals! Drive to Kaesong City (2 hours) – this ancient city is only a stone’s throw away from the DMZ. Lunch at the Thongil Restaurant in Kaesong City – try your hand at traditional Korean Pansangi – a series of dishes served in bronze bowls. (Optional extras: Dog soup 5 euro, Ginseng Stuffed Whole Chicken 30 euro – can be split between several). Drop by Sariwon City (Capital of North Hwanghae province) to walk in the local folk custom park and view the city from the mountain top pagoda. You can also try locally brewed Makkoli in a local bar. Dinner at a local Korean restaurant to try the famous Pyongyang cold noodles or Korean Bibimbap. Group A train members depart at 10:25am for Beijing on train K28. (Arriving at 9:00am on Sunday the 13th). 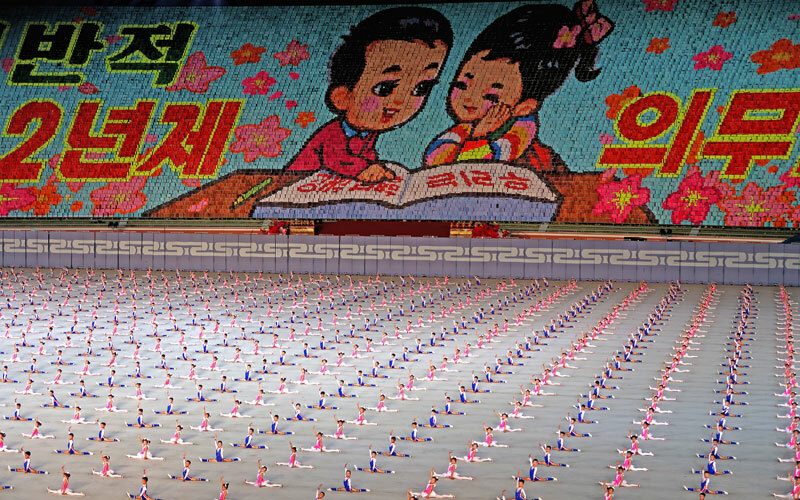 Songdowan International Children’s Union Camp- This recently renovated summer camp was designed for children both in the DPRK and for international guests. It holds a small water park, dormitories, aquatic centre, aviary, track ‘n field and much more. 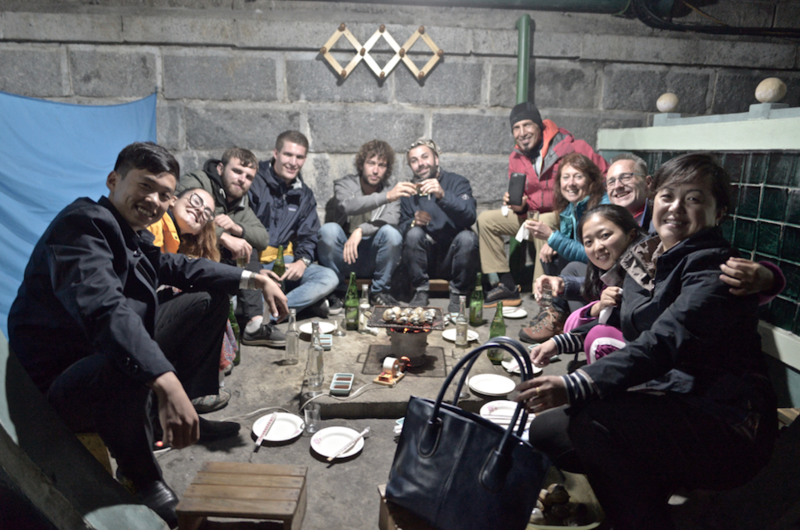 Trip highlight: Swim at Wonsan beach and hang out with the locals! 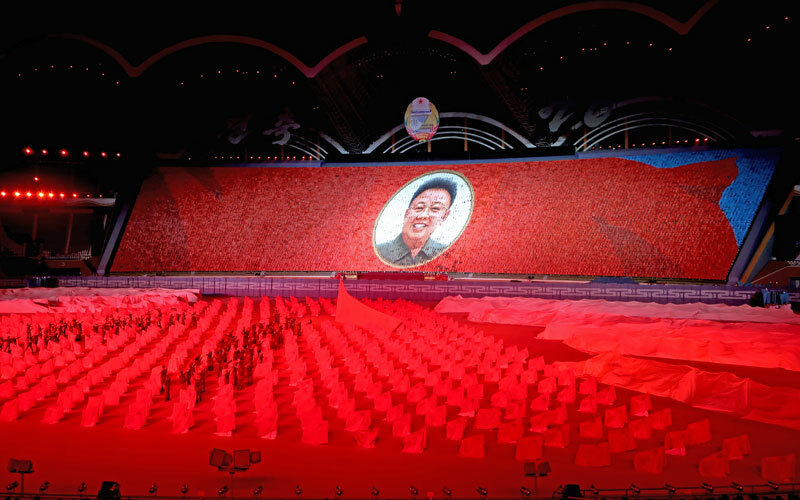 Head further south towards the DMZ to Mt. Kumgang (2 hours). Stop at Samil Lagoon for breathtaking photos and refreshments. Check in Mt. Kumgang Hotel – this hotel was renovated by South Koreans with spectacular views of the Mt. Kumgang ranges. Hike to Kuryong falls – the most famous scenic place in the Mt. 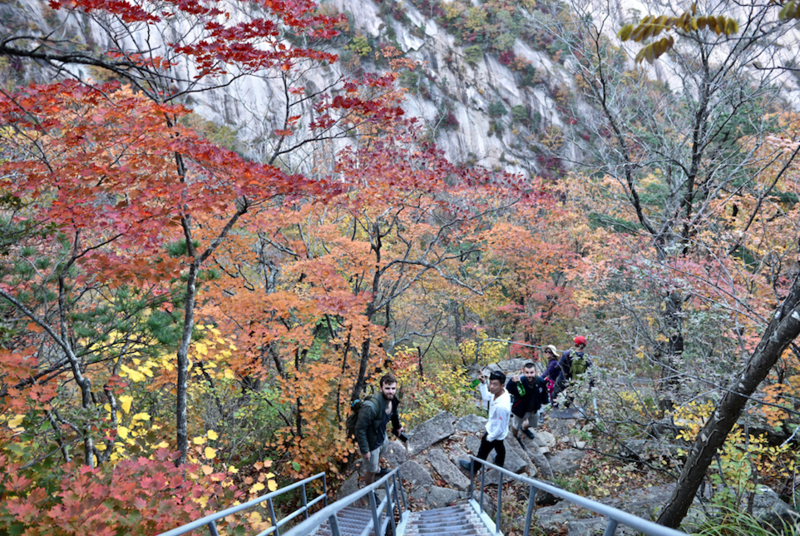 Kumgang region with absolutely stunning and surreal views of multi-coloured Autumnal leaves and crystal clear rock pools. Stop by Mt. Kumgang Natural Spa – here you can get a deep massage or soak up the natural spring water – optional and extra cost. Exotic dinner and drinks nearby the hotel whilst taking in the breathtaking views. Visit the former Railway Station Revolutionary site where an old Japanese steam engine rests. Drive back to Pyongyang stopping at Ulim Waterfall for a picnic lunch. Visit Meari Shooting Range – this shooting range has recently been renovated to include indoor shooting with pistols, rifles or archery! 50 US cents per bullet. Stop by the Mansugyo Beer Bar for some refreshments with the locals. Group B train members depart at 10:25am for Beijing on train K28. Train members arrive in Beijing Railway Station at 9:00am. Head further south to see the Panmunjon section of the DMZ, and also take a less common trip to an observation post along the Northern Limit line.